Two vast continents (China and Russia) lay in close proximity. Vast stretches of land each with a part buried past. Earth is heavy, strained by corrosion yet images ooze out into a half-light composed of memory shards tinged and frayed by forgetting. Impulses to create, waves of images, or a tumult, insistent in their returning, again and again, refracting in densities, as if collecting fresh debris each time in order to become other. What was smooth before, simply striates, but in striating, revealing new strata. Then again something always returns like an echo. Spaces of art are like recording machines of traces. Ghosts, shadows, whispers, memories are in evidence, but also the reality of presence. (Presence though might be the strangest of all things because it comes from the future, surely an unfathomable paradox). Within this, time and visibility do not follow one after the other, but instead converge through the warping of both. 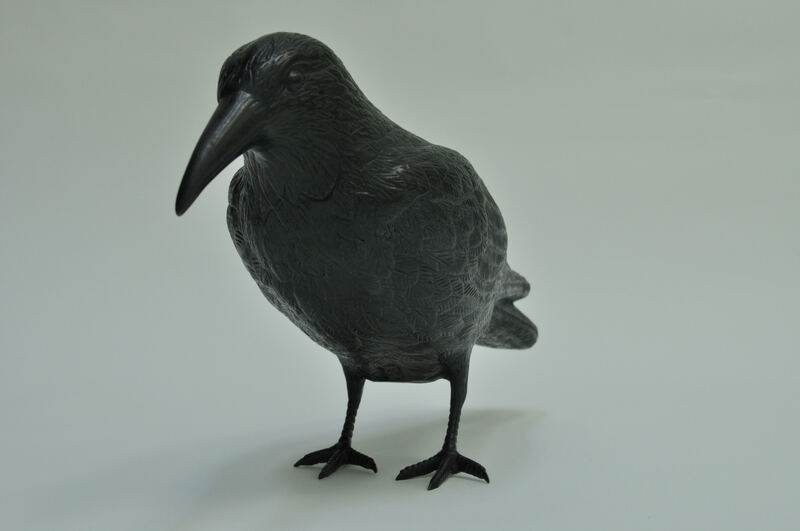 Daniel Bragin, Crow, bronze, black patina, 2013. Daniel Bragin b. 1981, Moscow; lives and works in London. Solo exhibitions include: SLUSH, Bosse & Baum, London 2013, The Closed Gallery, Thessaloniki, 2012. Selected Group Exhibitions include: Neu West Gallery, Berlin, 2015; Kurni Kurato, Berlin, 2015; Walls, Pushkin House, London 2014; In the Flesh, OSB Gallery, Tonbridge, 2014; Winter Projects, Heygate Estate, London, 2013; Kristin Hjellegjerde, Arteco Gallery, London, 2013; Show RCA, Royal College of Art, London, 2013;Gaiety is the most outstanding feature of the Soviet Union, Saatchi Gallery, London, 2013; Achter de Basiliek, Public Space Project in Hengelo, 2012; Concordia, Enschede, 2012; Jong Talent, Art Olive, Amsterdam, 2011. Chao Lu b. 1988, Shenyang; lives and works between London and Shenyang. Solo exhibitions: Black Mirror, Booth Presentation, Art Basel Hong Kong, 2015; Black Forest, Hadrien de Montferrand Gallery, Beijing, 2013. Selected Group Exhibitions include: Art Brussels, Booth Presentations, Brussels 2015; Around Drawing, Rosenfeld Porcini, London, 2015; A New Circle, Forbidden City Gallery, Shanghai, 2014; Saatchi New Sensations, Victoria House, London 2014; Life and Hope, Sanofi French Institute, Beijing, 2014; Riverlight Summer Studios, Royal College of Art, London, 2014; Show RCA 2014, Royal College of Art, London, 2014;The Others, Hanmi Gallery, London, 2013; Drawing Now, Carousel du Louvre, Paris, 2013; Days Under the Sunlight, China Central Academy of Fine Art, Beijing, 2012. Lian Zhang b. 1984, Hangzhou; lives and works between London and Hangzhou. Selected exhibitions include: Art 15, Lychee One, London, 2015; 10 Year Anniversary Show, Cynthia Corbet Gallery, London, 2014; The Open West 2014, The Wilson | Cheltenham Art Gallery & Museum, Cheltenham, 2014; Deserts of Humanity, Display Gallery, London, 2014; Painting Show and Performances, Winter Projects, London, 2013; Young Masters, Sphinx Fine Art, London, 2013; The Masks We Wear, Arteco Gallery, London, 2013; RCA Degree Show, Royal College of Art, London 2013; Graduation Show, China Academy of Art, Hangzhou, 2010.